A laptop, often called a notebook or notebook computer, is a portable personal computer with a "clamshell" form factor, a keyboard on the lower part of the "clamshell" and a thin LCD or LED computer screen on the upper portion, which is opened up to use the computer. Laptops are folded shut for transportation, and thus are suitable for mobile use. Although originally there was a distinction between laptops and notebooks, the former being bigger and heavier than the latter, as of 2014, there is often no longer any difference. Laptops are commonly used in a variety of settings, such as at work, in education, and for personal multimedia and home computer use. A laptop combines the components, inputs, outputs, and capabilities of a desktop computer, including the display screen, speakers, a keyboard, pointing devices (such as a touchpad or trackpad), a processor, and memory into a single unit. Most 2016-era laptops also have integrated webcams and built-in microphones. The device can be powered either from a rechargeable battery or by power supply from an AC adapter. Hardware specifications, such as the processor speed and memory capacity, significantly vary between different types, makes, and models. Design elements, form factor, and construction can also vary significantly between models depending on intended use; examples of specialized models of laptops include rugged notebooks for use in construction or military applications, as well as low production cost offerings such as those from the One Laptop per Child organization, which incorporate features like solar charging and semi flexible components not found on most laptop computers. Portable computers, which later developed into modern laptops, were originally considered to be a small niche market, mostly for specialized field applications, such as in the military, for accountancy, or for traveling sales representatives. As portable computers evolved into the modern laptop, they became widely used for a variety of purposes. The terms laptop and notebook are used interchangeably to describe a portable computer in English, although in some parts of the world one or the other may be preferred. There is some question as to the original etymology and specificity of either term—the term laptop appears to have been coined in the early 1980s to describe a mobile computer which could be used on one's lap, and to distinguish these devices from earlier, much heavier, portable computers (often called "luggables"). The term "notebook" appears to have gained currency somewhat later as manufacturers started producing even smaller portable devices, further reducing their weight and size and incorporating a display roughly the size of A4 paper; these were marketed as notebooks to distinguish them from bulkier laptops. Regardless of the etymology, by the late 1990s, the terms were interchangeable. As the personal computer (PC) became feasible in 1971, the idea of a portable personal computer soon followed. 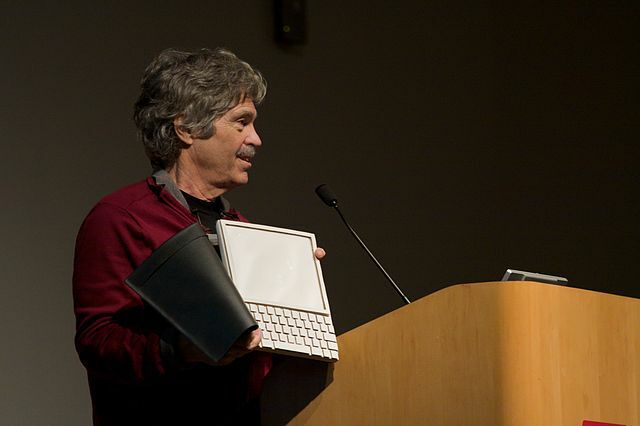 A "personal, portable information manipulator" was imagined by Alan Kay at Xerox PARC in 1968, and described in his 1972 paper as the "Dynabook". The IBM Special Computer APL Machine Portable (SCAMP) was demonstrated in 1973. This prototype was based on the IBM PALM processor. The IBM 5100, the first commercially available portable computer, appeared in September 1975, and was based on the SCAMP prototype. As 8-bit CPU machines became widely accepted, the number of portables increased rapidly. The Osborne 1, released in 1981, used the Zilog Z80 and weighed 23.6 pounds (10.7 kg). It had no battery, a 5 in (13 cm) CRT screen, and dual 5.25 in (13.3 cm) single-density floppy drives. In the same year the first laptop-sized portable computer, the Epson HX-20, was announced. The Epson had a LCD screen, a rechargeable battery, and a calculator-size printer in a 1.6 kg (3.5 lb) chassis. Both Tandy/RadioShack and HP also produced portable computers of varying designs during this period. 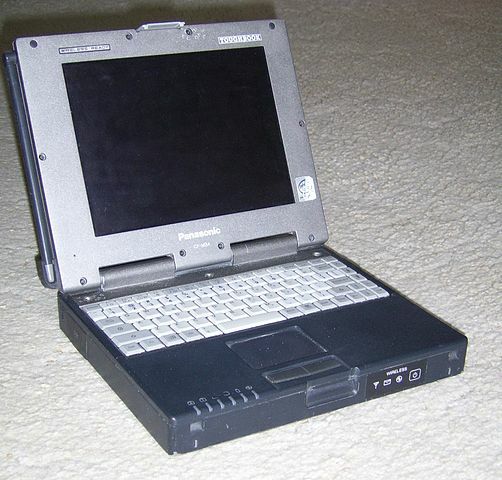 The first laptops using the flip form factor appeared in the early 1980s. The Dulmont Magnum was released in Australia in 1981–82, but was not marketed internationally until 1984–85. The US$8,150 (US$19,980 today) GRiD Compass 1100, released in 1982, was used at NASA and by the military, among others. The Gavilan SC, released in 1983, was the first computer described as a "laptop" by its manufacturer. From 1983 onward, several new input techniques were developed and included in laptops, including the touchpad (Gavilan SC, 1983), the pointing stick (IBM ThinkPad 700, 1992), and handwriting recognition (Linus Write-Top, 1987). Some CPUs, such as the 1990 Inteli 386SL, were designed to use minimum power to increase battery life of portable computers and were supported by dynamic power management features such as Intel SpeedStep and AMD PowerNow! in some designs. Displays reached 640x480 (VGA) resolution by 1988 (Compaq SLT/286), and color screens started becoming a common upgrade in 1991, with increases in resolution and screen size occurring frequently until the introduction of 17" screen laptops in 2003. Hard drives started to be used in portables, encouraged by the introduction of 3.5" drives in the late 1980s, and became common in laptops starting with the introduction of 2.5" and smaller drives around 1990; capacities have typically lagged behind physically larger desktop drives. 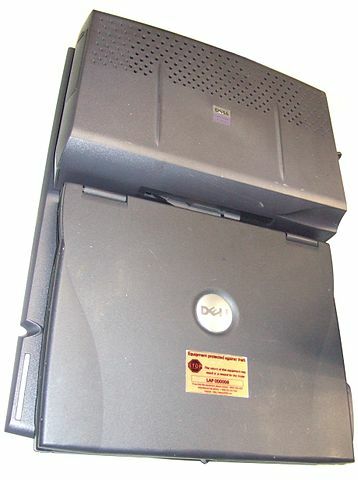 Optical storage, read-only CD-ROM followed by writeable CD and later read-only or writeable DVD and Blu-ray players, became common in laptops early in the 2000s. Since the introduction of portable computers during late 1970s, their form has changed significantly, spawning a variety of visually and technologically differing subclasses. Except where there is a distinct legal trademark around a term (notably Ultrabook), there are rarely hard distinctions between these classes and their usage has varied over time and between different sources. The form of the traditional laptop computer is a clamshell, with a screen on one of its inner sides and a keyboard on the opposite, facing the screen. It can be easily folded to conserve space while traveling. The screen and keyboard are inaccessible while closed. Devices of this form are commonly called a 'traditional laptop' or notebook, particularly if they have a screen size of 11 to 17 inches measured diagonally and run a full-featured operating system like Windows 10, OS X, or Linux. 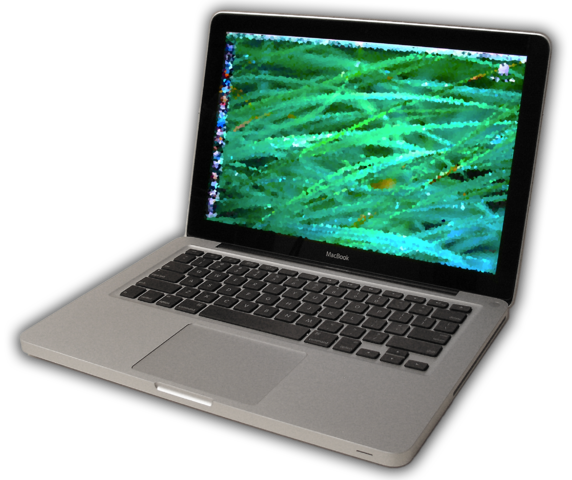 Traditional laptops are the most common form of laptops, although Chromebooks, Ultrabooks, convertibles and 2-in-1s (described below) are becoming more common, with similar performance being achieved in their more portable or affordable forms. A subnotebook or an ultraportable, is a laptop designed and marketed with an emphasis on portability (small size, low weight, and often longer battery life). Subnotebooks are usually smaller and lighter than standard laptops, weighing between 0.8 and 2 kg (2-5 lb), with a battery life exceeding 10 hours. Since the introduction of netbooks and ultrabooks, the line between subnotebooks and either category has blurred. Netbooks are a more basic and cheap type of subnotebook, and while some ultrabooks have a screen size too large to qualify as subnotebooks, certain ultrabooks fit in the subnotebook category. One notable example of a subnotebook is the Apple MacBook Air. The netbook was an inexpensive, light-weight, energy-efficient form of laptop, especially suited for wireless communication and Internet access. Netbooks first became commercially available around 2008, weighing under 1 kg, with a display size of under 9". The name netbook (with net short for Internet) is used as "the device excels in web-based computing performance". Netbooks were initially sold with light-weight variants of the Linux operating system, although later versions often have the Windows XP or Windows 7 operating systems. 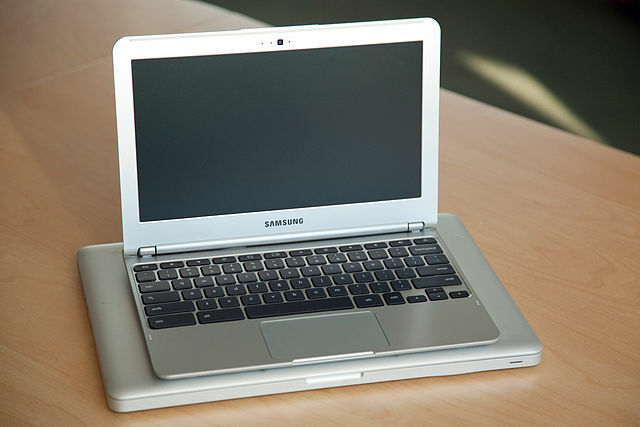 The term "netbook" is largely obsolete, although machines that would have once been called netbooks—small, inexpensive, and low powered—never ceased being sold, in particular the smaller Chromebook models. The latest trend of technological convergence in the portable computer industry spawned a broad range of devices, with a combined features of several previously separate device types. The hybrids, convertibles and 2-in-1s emerged as crossover devices, which share traits of both tablets and laptops. All such devices have a touchscreen display designed to allow users to work in a tablet mode, using either multi-touch gestures or a stylus/digital pen. Convertibles are devices with the ability to conceal a hardware keyboard. 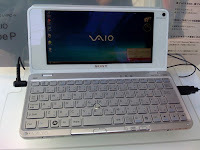 Keyboards on such devices can be flipped, rotated, or slid behind the back of the chassis, thus transforming from a laptop into a tablet. Hybrids have a keyboard detachment mechanism, and due to this feature, all critical components are situated in the part with the display. 2-in-1s can have a hybrid or a convertible form, often dubbed 2-in-1 detachables and 2-in-1 convertibles respectively, but are distinguished by the ability to run a desktop OS, such as Windows 10. 2-in-1s are often marketed as laptop replacement tablets. 2-in-1s are often very thin, around 10 millimetres (0.39 in), and light devices with a long battery life. 2-in-1s are distinguished from mainstream tablets as they feature an x86-architecture CPU (typically a low- or ultra-low-voltage model), such as the Intel Core i5, run a full-featured desktop OS like Windows 10, and have a number of typical laptop I/O ports, such as USB 3 and Mini DisplayPort. 2-in-1s are designed to be used not only as a media consumption device, but also as valid desktop or laptop replacements, due to their ability to run desktop applications, such as Adobe Photoshop. It is possible to connect multiple peripheral devices, such as a mouse, keyboard, and a number of external displays to a modern 2-in-1. 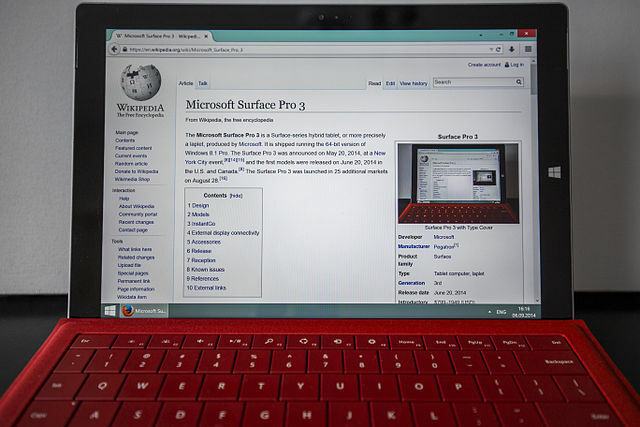 Microsoft Surface Pro-series devices and Surface Book are examples of modern 2-in-1 detachables, whereas Lenovo Yoga-series computers are a variant of 2-in-1 convertibles. While the older Surface RT and Surface 2 have the same chassis design as the Surface Pro, their use of ARM processors and Windows RT do not classify them as 2-in-1s, but as hybrid tablets. 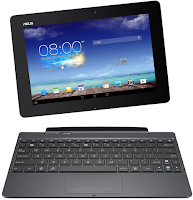 Similarly, a number of hybrid laptops run a mobile operating system, such as Android. These include Asus's Transformer Pad devices, example of hybrids with a detachable keyboard design, which not fall in the category of 2-in-1s. A desktop-replacement laptop is a class of large device which is not intended primarily for mobile use. They are bulkier and not as portable as other laptops, and are intended for use as compact and transportable alternatives to a desktop computer. Desktop replacements are larger and typically heavier than other classes of laptops. They are capable of containing more powerful components and have a 15-inch or larger display. Desktop replacement laptops' operation time on batteries is typically shorter than other laptops; in rare cases they have no battery at all. In the past, some laptops in this class used a limited range of desktop components to provide better performance for the same price at the expense of battery life, although this practice has largely died out. The names Media Center Laptops and Gaming Laptops are used to describe specialized notebook computers, often overlapping with the desktop replacement form factor. A rugged laptop is designed to reliably operate in harsh usage conditions such as strong vibrations, extreme temperatures, and wet or dusty environments. Rugged laptops are usually designed from scratch, rather than adapted from regular consumer laptop models. Rugged laptops are bulkier, heavier, and much more expensive than regular laptops, and thus are seldom seen in regular consumer use. The design features found in rugged laptops include a rubber sheeting under the keyboard keys, sealed port and connector covers, passive cooling, very bright displays easily readable in daylight, cases and frames made of magnesium alloys that are much stronger than plastics found in commercial laptops, and solid-state storage devices or hard disc drives that are shock mounted to withstand constant vibrations. Rugged laptops are commonly used by public safety services (police, fire, and medical emergency), military, utilities, field service technicians, construction, mining, and oil drilling personnel. Rugged laptops are usually sold to organizations rather than individuals, and are rarely marketed via retail channels. The basic components of laptops function identically to their desktop counterparts. Traditionally they were miniaturized and adapted to mobile use, although desktop systems increasingly use the same smaller, lower-power parts which were originally developed for mobile use. The design restrictions on power, size, and cooling of laptops limit the maximum performance of laptop parts compared to that of desktop components, although that difference has increasingly narrowed. In general, laptop components are not intended to be replaceable or upgradable, with the exception of components which can be detached, such as a battery or CD/CDR/DVD drive. This restriction is one of the major differences between laptops and desktop computers, because the large "tower" cases used in desktop computers are designed so that new motherboards, hard disks, sound cards,RAM, and other components can be added. In a very compact laptop, such as laplets, there may be no upgradeable components at all. Intel, Asus, Compal, Quanta, and some other laptop manufacturers have created the Common Building Block standard for laptop parts to address some of the inefficiencies caused by the lack of standards and inability to upgrade components. The following sections summarizes the differences and distinguishing features of laptop components in comparison to desktop personal computer parts. Most modern laptops feature a 13 inches (33 cm) or larger color active matrix display based on LED lighting with resolutions of 1280×800 (16:10) or 1366×768 (16:9) pixels and above. Models with LED-based lighting offer lesser power consumption, and often increased brightness. Netbooks with a 10 inches (25 cm) or smaller screen typically use a resolution of 1024×600, while netbooks and subnotebooks with a 11.6 inches (29 cm) or 12 inches (30 cm) screen use standard notebook resolutions. Having a higher resolution display allows more items to fit onscreen at a time, improving the user's ability to multitask, although at the higher resolutions on smaller screens, the resolution may only serve to display sharper graphics and text rather than increasing the usable area. Since the introduction of the MacBook Pro with Retina display in 2012, there has been an increase in the availability of very-high resolution (1920×1080 and higher) displays, even in relatively small systems, and in typical 15-inch screens resolutions as high as 3200×1800 are available. External displays can be connected to most laptops, and models with a Mini DisplayPort can handle up to three. A laptop's central processing unit (CPU) has advanced power-saving features and produces less heat than one intended purely for desktop use. Typically, laptop CPUs have two processor cores, although 4-core models are also available. For low price and mainstream performance, there is no longer a significant performance difference between laptop and desktop CPUs, but at the high end, the fastest 4-to-8-core desktop CPUs still substantially outperform the fastest 4-core laptop processors, at the expense of massively higher power consumption and heat generation; the fastest laptop processors top out at 56 watts of heat, while the fastest desktop processors top out at 150 watts. There have been a wide range of CPUs designed for laptops available from both Intel, AMD, and other manufacturers. On non-x86architectures, Motorola and IBM produced the chips for the former PowerPC-based Apple laptops (iBook and PowerBook). Many laptops have removable CPUs, although this has become less common in the past few years as the trend has been towards thinner and lighter models. 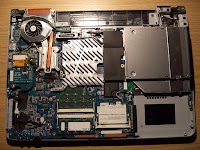 In other laptops the CPU is soldered on the motherboard and is non-replaceable; this is nearly universal in ultrabooks. In the past, some laptops have used a desktop processor instead of the laptop version and have had high performance gains at the cost of greater weight, heat, and limited battery life, but the practice was largely extinct as of 2013. Unlike their desktop counterparts, laptop CPUs are nearly impossible to overclock. A thermal operating mode of laptops is very close to its limits and there is almost no headroom for an overclocking–related operating temperature increase. The possibility of improving a cooling system of a laptop to allow overclocking is extremely difficult to implement. On most laptops a graphical processing unit (GPU) is integrated into the CPU to conserve power and space. This was introduced by Intel with the Core i-series of mobile processors in 2010, and similar APU processors by AMD later that year. Prior to that, lower-end machines tended to use graphics processors integrated into the system chipset, while higher end machines had a separate graphics processor. In the past, laptops lacking a separate graphics processor were limited in their utility for gaming and professional applications involving 3D graphics, but the capabilities of CPU-integrated graphics have converged with the low-end of dedicated graphics processors in the past few years. Higher-end laptops intended for gaming or professional 3D work still come with dedicated, and in some cases even dual, graphics processors on the motherboard or as an internal expansion card. Since 2011, these almost always involve switchable graphics so that when there is no demand for the higher performance dedicated graphics processor, the more power-efficient integrated graphics processor will be used. Nvidia Optimus is an example of this sort of system of switchable graphics. Most laptops use SO-DIMM (small outline dual in-line memory module) memory modules, as they are about half the size of desktop DIMMs. They are sometimes accessible from the bottom of the laptop for ease of upgrading, or placed in locations not intended for user replacement. Most laptops have two memory slots, although some of the lowest-end models will have only one, and some high end models (usually mobile engineering workstations and a few high-end models intended for gaming) have four slots. Most mid-range laptops are factory equipped with 4–6 GB of RAM. Netbooks are commonly equipped with only 1–2 GB of RAM and are generally only expandable to 2 GB, if at all. Due to the limitation of DDR3 SO-DIMM of a maximum of 8 GB per module, most laptops can only be expanded to a total of 16 GB of memory, until systems using DDR4 memory start becoming available. 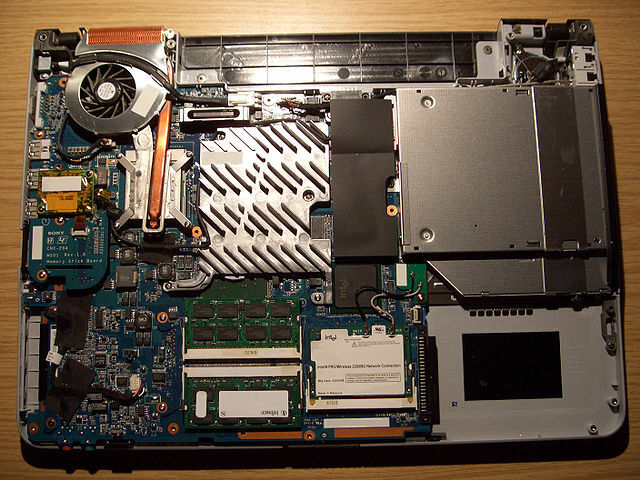 Laptops may have memory soldered to the motherboard to conserve space, which allows the laptop to have a thinner chassis design. Soldered memory cannot be upgraded. Traditionally, laptops had a hard disk drive (HDD) as a main non-volatile storage, but these proved inefficient for use in mobile devices due to high power consumption, heat production, and a presence of moving parts, which can cause damage to both the drive itself and the data stored when a laptop is unstable physically, e.g. during its use while transporting it or after its accidental drop. With the advent of flash memory technology, most mid- to high-end laptops opted for more compact, power efficient, and fast solid-state drives (SSD), which eliminated the hazard of drive and data corruption caused by a laptop's physical impacts. Most laptops use 2.5-inch drives, which are a smaller version of a 3.5-inch desktop drive form factor. 2.5-inch HDDs are more compact, power efficient, and produce less heat, while at the same time have a smaller capacity and a slower data transfer rate. Some very compact laptops support even smaller 1.8-inch HDDs. For SSDs, however, these miniaturization-related trade-offs are nonexistent, because SSDs were designed to have a very small footprint. SSDs feature a traditional 2.5- or 1.8-inch or a laptop-specific mSATA or M.2 card's form factor. SSDs have a higher data transfer rate, lower power consumption, lower failure rate, and a larger capacity compared to HDDs. However, HDDs have a significantly lower cost. Most laptops can contain a single 2.5-inch drive, but a small number of laptops with a screen wider than 17 inches can house two drives. Some laptops support a hybrid mode, combining a 2.5-inch drive, typically a spacious HDD for data, with an mSATA or M.2 SDD drive, typically having less capacity, but a significantly faster read/write speed. The operating system partition would be located on the SSD to increase laptop I/O performance. Another way to increase performance is to use a smaller SSD of 16-32 GB as a cache drive with a compatible OS. Some laptops may have very limited drive upgradeability when the SSD used has a non-standard shape and/or requires a proprietary daughter card. Some laptops have very limited space on the installed SSD, instead relying on availability of cloud storage services for storing of user data; Chromebooks are a prominent example of this approach. A variety of external HDDs or NAS data storage servers with support of RAID technology can be attached to virtually any laptop over such interfaces as USB, FireWire, eSATA, or Thunderbolt, or over a wired or wireless network to further increase space for the storage of data. Many laptops also incorporate a card reader which allows for use of memory cards, such as those used for digital cameras, which are typically SD or microSD cards. This enables users to download digital pictures from an SD card onto a laptop, thus enabling them to delete the SD card's contents to free up space for taking new pictures. Optical disc drives capable of playing Compact discs(CD), DVDs, and in some cases, Blu-ray Discs (BD), were nearly universal on full-sized models in the 2010s. A disc drive remains fairly common in laptops with a screen wider than 15 inches (38 cm), although the trend towards thinner and lighter machines is gradually eliminating these drives and players; these drives are uncommon in compact laptops, such as subnotebooks and netbooks. Laptop optical drives tend to follow a standard form factor, and usually have a standard mSATA connector. It is often possible to replace an optical drive with a newer model. In certain laptop models there is a possibility to replace an optical drive with a second hard drive, using a caddy that fills the extra space the optical drive would have occupied. A touchpad (also called a trackpad), a pointing stick, or both, are used to control the position of the cursor on the screen, and an integrated keyboard is used for typing. An external keyboard and/or mouse may be connected using a USB port or wirelessly, via Bluetooth or similar technology. With the advent of ultrabooks and support of touch input on screens by 2010-era operating systems, such as Windows 8.1, multitouch touchscreen displays are used on some models. On a typical laptop there are several USB ports, an external monitor port (VGA, DVI, HDMI or Mini DisplayPort), an audio in/out port (often in form of a single socket) is common. It is possible to connect up to three external displays to a 2014-era laptop via a single Mini DisplayPort, utilizing multi-stream transport technology. 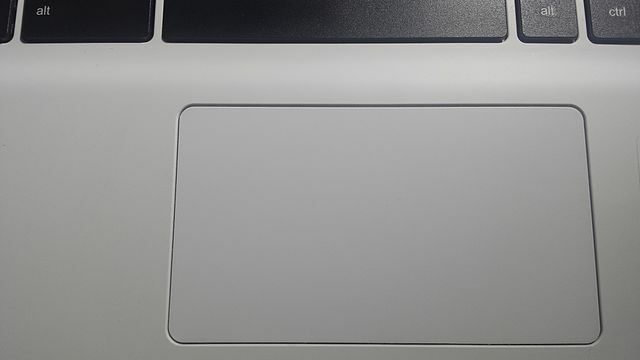 Apple, in a 2015 version of its MacBook, transitioned from a number of different I/O ports to a single USB Type-C port. This port can be used both for charging and connecting a variety of devices through the use of aftermarket adapters. Google, with its updated version of Chromebook Pixel, shows a similar transition trend towards USB Type-C, although keeping older USB Type-A ports for a better compatibility with older devices. Although being common until the end of the 2000s decade, Ethernet network port are rarely found on modern laptops, due to widespread use of wireless networking, such as Wi-Fi. Legacy ports such as a PS/2 keyboard/mouse port, serial port, parallel port, or Firewire are provided on some models, but the are increasingly rare. On Apple's systems, and on a handful of other laptops, there are also Thunderbolt ports, but Thunderbolt 3 uses USB Type-C. In the past, a PC Card (formerly PCMCIA) or ExpressCard slot for expansion was often present on laptops to allow adding and removing functionality, even when the laptop is powered on; these are becoming increasingly rare since the introduction of USB 3.0. Some internal subsystems such as: ethernet, Wi-Fi, or a Wireless cellular modem can be implemented as replaceable internal expansion cards, usually accessible under an access cover on the bottom of the laptop. The standard for such cards is PCI Express, which comes in both mini and even smaller M.2 sizes. In newer laptops, it is not uncommon to also see Micro SATA (mSATA) functionality on PCI Express Mini or M.2 card slots allowing the use of those slots for SATA-based solid state drives. 2016-era laptops use lithium ion batteries, with some thinner models using the flatter lithium polymer technology. These two technologies have largely replaced the older nickel metal-hydride batteries. Battery life is highly variable by model and workload, and can range from one hour to nearly a day. A battery's performance gradually decreases over time; substantial reduction in capacity is typically evident after one to three years of regular use, depending on the charging and discharging pattern and the design of the battery. Innovations in laptops and batteries have seen situations in which the battery can provide up to 24 hours of continued operation, assuming average power consumption levels. An example is the HP EliteBook 6930p when used with its ultra-capacity battery. A laptop's battery is charged using an external power supply which is plugged into a wall outlet. The power supply outputs a DC voltage typically in the range of 7.2—24 volts. The power supply is usually external, and connected to the laptop through a DC connector cable. In most cases, it can charge the battery and power the laptop simultaneously. When the battery is fully charged, the laptop continues to run on power supplied by the external power supply, avoiding battery use. The battery charges in a shorter period of time if laptop is turned off or sleeping. The charger typically adds about 400 grams (0.88 lb) to the overall transporting weight of a laptop, although some models are substantially heavier or lighter. Most 2016-era laptops use a smart battery, a rechargeable battery pack with a built-in battery management system (BMS). The smart battery can internally measure voltage and current, and deduce charge level and SoH (State of Health) parameters, indicating the state of the cells. Waste heat from operation is difficult to remove in the compact internal space of a laptop. 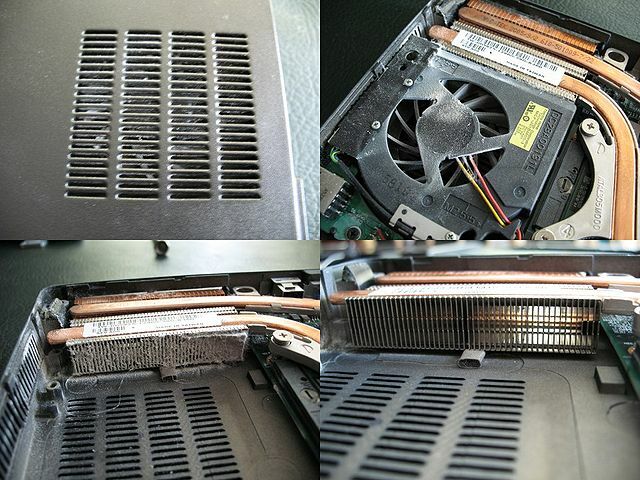 Early laptops used heat sinks placed directly on the components to be cooled, but when these hot components are deep inside the device, a large space-wasting air duct is needed to exhaust the heat. Modern laptops instead rely on heat pipes to rapidly move waste heat towards the edges of the device, to allow for a much smaller and compact fan and heat sink cooling system. Waste heat is usually exhausted away from the device operator towards the rear or sides of the device. Multiple air intake paths are used since some intakes can be blocked, such as when the device is placed on a soft conforming surface like a chair cushion. It is believed that some designs with metal cases, like Apple's aluminum MacBook Pro and MacBook Air, also employ the case of the machine as a heat sink, allowing it to supplement cooling by dissipating heat out of the device core. Secondary device temperature monitoring may reduce performance or trigger an emergency shutdown if it is unable to dissipate heat, such as if the laptop were to be left running and placed inside a carrying case. Such a condition has the potential to melt plastics or ignite a fire. Aftermarket cooling pads with external fans can be used with most laptops to reduce operating temperatures. A docking station (sometimes referred to simply as a dock) is a laptop accessory that contains multiple ports, and in some cases expansion slots and/or bays for fixed or removable drives. A laptop connects and disconnects to a docking station, typically through a single large proprietary connector. A docking station is an especially popular laptop accessory in a corporate computing environment, due to a possibility of a docking station to transform a laptop into a full-featured desktop replacement, yet allowing for its easy release. This ability can be advantageous to "road warrior" employees who have to travel frequently for work, and yet who also come into the office. If more ports are needed, or their position on a laptop is inconvenient, one can use a cheaper passive device known as a port replicator. These devices mate to the connectors on the laptop, such as through USB or FireWire. Laptop charging trolleys, also known as laptop trolleys or laptop carts, are mobile storage containers to charge multiple laptops, netbooks, and tablet computers at the same time. The trolleys are used in schools that have replaced their traditional static computer labs suites of desktop equipped with "tower" computers, but do not have enough plug sockets in an individual classroom to charge all of the devices. The trolleys can be wheeled between rooms and classrooms so that all students and teachers in a particular building can access fully charged IT equipment. Laptop charging trolleys are also used to deter and protect against opportunistic and organized theft. Schools, especially those with open plan designs, are often prime targets for thieves who steal high-value items. 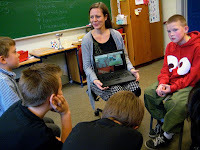 Laptops, netbooks, and tablets are among the highest–value portable items in a school. Moreover, laptops can easily be concealed under clothing and stolen from buildings. Many types of laptop–charging trolleys are designed and constructed to protect against theft. They are generally made out of steel, and the laptops remain locked up while not in use. Although the trolleys can be moved between areas from one classroom to another, they can often be mounted or locked to the floor or walls to prevent thieves from stealing the laptops, especially overnight. In some laptops, solar panels are able to generate enough solar power for the laptop to operate. The One Laptop Per Child Initiative released the OLPC XO-1 laptop which was tested and successfully operated by use of solar panels. Presently, they are designing a OLPC XO-3 laptop with these features. The OLPC XO-3 can operate with 2 watts of electricity because its renewable energy resources generate a total of 4 watts. Samsung has also designed the NC215S solar–powered notebook that will be sold commercially in the U.S. market. Productivity: Using a laptop in places where a desktop PC cannot be used can help employees and students to increase their productivity on work or school tasks. For example, an office worker reading her work e-mails during an hour-long commute by train, or a student doing her homework at the university coffee shop during a break between lectures. Immediacy: Carrying a laptop means having instant access to information, including personal and work files. This allows better collaboration between coworkers or students, as a laptop can be flipped open to look at a report, document, spreadsheet, or presentation anytime and anywhere. Up-to-date information: If a person has more than one desktop PC, a problem of synchronization arises: changes made on one computer are not automatically propagated to the others. There are ways to resolve this problem, including physical transfer of updated files (using a USB flash memory stick or CDRs) or using synchronization software over the Internet, such as cloud computing. However, transporting a single laptop to both locations avoids the problem entirely, as the files exist in a single location and are always up-to-date. 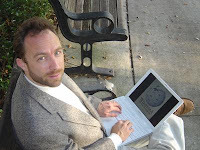 Connectivity: In the 2010s, a proliferation of Wi-Fi wireless networks and cellular broadband data services (HSDPA, EVDO and others) in many urban centers, combined with near-ubiquitous Wi-Fi support by modern laptops meant that a laptop could now have easy Internet and local network connectivity while remaining mobile. Wi-Fi networks and laptop programs are especially widespread at university campuses. Size: Laptops are smaller than desktop PCs. This is beneficial when space is at a premium, for example in small apartments and student dorms. When not in use, a laptop can be closed and put away in a desk drawer. Low power consumption: Laptops are several times more power-efficient than desktops. A typical laptop uses 20–120 W, compared to 100–800 W for desktops. This could be particularly beneficial for large businesses, which run hundreds of personal computers thus multiplying the potential savings, and homes where there is a computer running 24/7 (such as a home media server, print server, etc.). Quiet: Laptops are typically much quieter than desktops, due both to the components (quieter, slower 2.5-inch hard drives) and to less heat production leading to use of fewer and slower cooling fans. Battery: a charged laptop can continue to be used in case of a power outage and is not affected by short power interruptions and blackouts. A desktop PC needs an Uninterruptible power supply (UPS) to handle short interruptions, blackouts, and spikes; achieving on-battery time of more than 20–30 minutes for a desktop PC requires a large and expensive UPS. 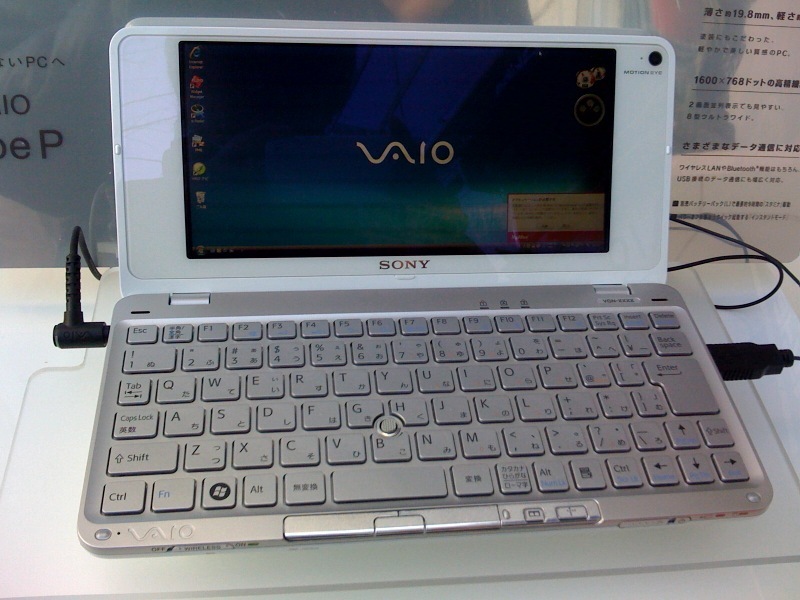 All-in-One: designed to be portable, most 2010-era laptops have all components integrated into the chassis (however, some small laptops may not have an internal CD/CDR/DVD drive, so an external drive needs to be used). For desktops (excluding all-in-ones) this is divided into the desktop "tower" (the unit with the CPU, hard drive, power supply, etc. ), keyboard, mouse, display, and optional peripherals such as speakers. While the performance of mainstream desktops and laptop is comparable, and the cost of laptops has fallen less rapidly than desktops, laptops remain more expensive than desktop PCs at the same performance level. The upper limits of performance of laptops remain much lower than the highest-end desktops (especially "workstation class" machines with two processor sockets), and "bleeding-edge" features usually appear first in desktops and only then, as the underlying technology matures, are adapted to laptops. For Internet browsing and typical office applications, where the computer spends the majority of its time waiting for the next user input, even relatively low-end laptops (such as Netbooks) can be fast enough for some users. As of mid-2010, at the lowest end, the cheapest netbooks—between US$200–300—remain more expensive than the lowest-end desktop computers (around US$200), but only when those are priced without a screen/monitor. Once an inexpensive monitor is added, the prices are comparable. Most higher-end laptops are sufficiently powerful for high-resolution movie playback, some 3D gaming and video editing and encoding. However, laptop processors can be disadvantaged when dealing with higher-end database, maths, engineering, financial software, virtualization, etc. This is because laptops use the mobile versions of processors to conserve power, and these lag behind desktop chips when it comes to performance. Also, the top-of-the-line mobile graphics processors (GPUs) are significantly behind the top-of-the-line desktop GPUs to a greater degree than the processors, which limits the utility of laptops for high-end 3D gaming and scientific visualization applications. Some manufacturers work around this performance problem by using desktop CPUs for laptops. Upgradeability of laptops is very limited compared to desktops, which are thoroughly standardized. In general, hard drives and memory can be upgraded easily. Optical drives and internal expansion cards may be upgraded if they follow an industry standard, but all other internal components, including the motherboard, CPU and graphics, are not always intended to be upgradeable. Intel, Asus, Compal, Quanta and some other laptop manufacturers have created the Common Building Block standard for laptop parts to address some of the inefficiencies caused by the lack of standards. The reasons for limited upgradeability are both technical and economic. There is no industry-wide standard form factor for laptops; each major laptop manufacturer pursues its own proprietary design and construction, with the result that laptops are difficult to upgrade and have high repair costs. Devices such as sound cards, network adapters, hard and optical drives, and numerous other peripherals are available, but these upgrades usually impair the laptop's portability, because they add cables and boxes to the setup and often have to be disconnected and reconnected when the laptop is on the move. Prolonged use of laptops can cause repetitive strain injury because of their small, flat keyboard and trackpad pointing devices,. Usage of separate, external ergonomic keyboards and pointing devices is recommended to prevent injury when working for long periods of time; they can be connected to a laptop easily by USB or via a docking station. Some health standards require ergonomic keyboards at workplaces. A laptop's integrated screen often requires users to lean over for a better view, which can cause neck and/or spinal injuries. 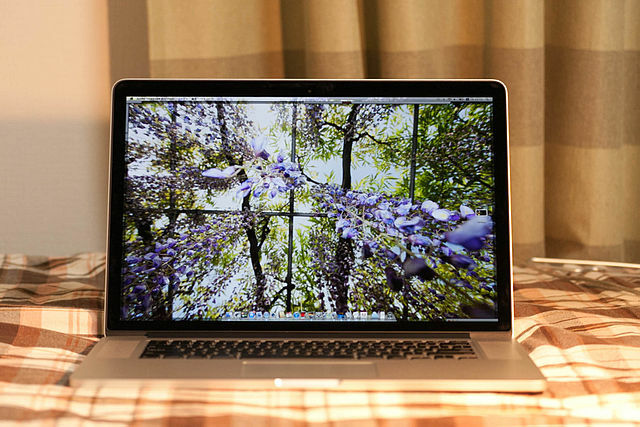 A larger and higher-quality external screen can be connected to almost any laptop to alleviate this and to provide additional screen space for more productive work. Another solution is to use a computer stand. A study by State University of New York researchers found that heat generated from laptops can increase the temperature of the lap of male users when balancing the computer on their lap, potentially putting sperm count at risk. The study, which included roughly two dozen men between the ages of 21 and 35, found that the sitting position required to balance a laptop can increase scrotum temperature by as much as 2.1 °C (4 °F). However, further research is needed to determine whether this directly affects male sterility. A later 2010 study of 29 males published in Fertility and Sterility found that men who kept their laptops on their laps experienced scrotal hyperthermia (overheating) in which their scrotal temperatures increased by up to 2.0 °C (4 °F). The resulting heat increase, which could not be offset by a laptop cushion, may increase male infertility. A common practical solution to this problem is to place the laptop on a table or desk, or to use a book or pillow between the body and the laptop. Another solution is to obtain a cooling unit for the laptop. These are usually USB powered and consist of a hard thin plastic case housing one, two, or three cooling fans – with the entire assembly designed to sit under the laptop in question – which results in the laptop remaining cool to the touch, and greatly reduces laptop heat buildup. Heat generated from using a laptop on the lap can also cause skin discoloration on the thighs known as "toasted skin syndrome". Because of their portability, laptops are subject to more wear and physical damage than desktops. Components such as screen hinges, latches, power jacks, and power cords deteriorate gradually from ordinary use, and may have to be replaced. A liquid spill onto the keyboard, a rather minor mishap with a desktop system (given that a basic keyboard costs about US$20), can damage the internals of a laptop and result destroy the computer or result in a costly repair. One study found that a laptop is three times more likely to break during the first year of use than a desktop. To maintain a laptop, it is recommended to clean it every three months for dirt, debris, dust, and food particles. Most cleaning kits consist of a lint-free or Microfiber cloth for the LCD screen and keyboard, compressed air for getting dust out of the cooling fan, and cleaning solution. Harsh chemicals such as bleach should not be used to clean a laptop, as they can damage the it. Original external components are expensive, and usually proprietary and non-interchangeable; other parts are inexpensive—a power jack can cost a few dollars—but their replacement may require extensive disassembly and reassembly of the laptop by a technician. Other inexpensive but fragile parts often cannot be purchased separate from larger more expensive components. For example, the video display cable and the backlight power cable that pass through the lid hinges to connect the motherboard to the screen will eventually break from repeated opening and closing of the lid. These tiny cables usually cannot be purchased from the original manufacturer separate from the entire LCD panel, with the price of hundreds of dollars, although for popular models an aftermarket in pulled parts generally exists. The repair costs of a failed motherboard or LCD panel often exceeds the value of a used laptop. Parts can also be ordered from third party vendors. Laptops rely on extremely compact cooling systems involving a fan and heat sink that can fail from blockage caused by accumulated airborne dust and debris. Most laptops do not have any type of removable dust collection filter over the air intake for these cooling systems, resulting in a system that gradually conducts more heat and noise as the years pass. In some cases the laptop starts to overheat even at idle load levels. 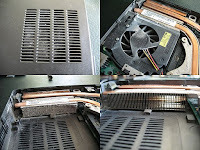 This dust is usually stuck inside where the fan and heat sink meet, where it can not be removed by a casual cleaning and vacuuming. Most of the time, compressed air can dislodge the dust and debris but may not entirely remove it. After the device is turned on, the loose debris is reaccumulated into the cooling system by the fans. A complete disassembly is usually required to clean the laptop entirely. However, preventative maintenance such as regular cleaning of the heat sink via compressed air can prevent dust build up on the heat sink. Many laptops are difficult to disassemble by the average user and contain components that are sensitive to electrostatic discharge (ESD). Battery life is limited because the capacity drops with time, eventually requiring replacement after as little as a year. A new battery typically stores enough energy to run the laptop for three to five hours, depending on usage, configuration, and power management settings. Yet, as it ages, the battery's energy storage will dissipate progressively until it lasts only a few minutes. The battery is often easily replaceable and a higher capacity model may be obtained for longer charging and discharging time. 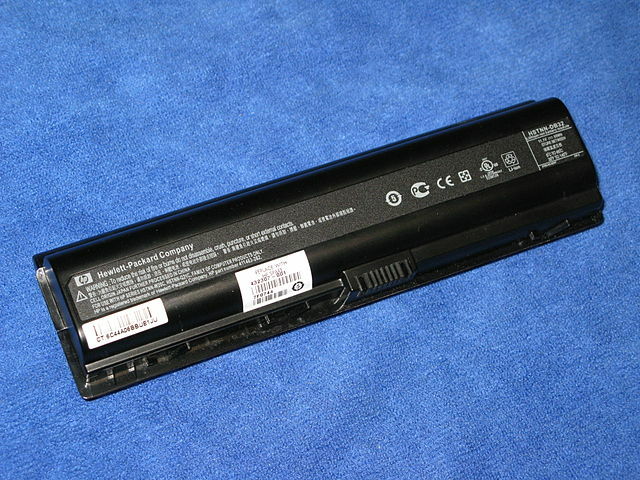 Some laptops (specifically ultrabooks) do not have the usual removable battery and have to be brought to the service center of its manufacturer to have its battery replaced. Replacement batteries can also be expensive. Because they are valuable, commonly used, portable, and easy to conceal in a backpack or other type of travel bag, laptops are prized targets for theft. Every day, over 1,600 laptops go missing from U.S. airports. The cost of stolen business or personal data, and of the resulting problems (identity theft, credit card fraud, breach of privacy), can be many times the value of the stolen laptop itself. Consequently, physical protection of laptops and the safeguarding of data contained on them are both of great importance. Most laptops have a Kensington security slot, which can be used to tether them to a desk or other immovable object with a security cable and lock. In addition, modern operating systems and third-party software offer disk encryption functionality, which renders the data on the laptop's hard drive unreadable without a key or a passphrase. As of 2015, some laptops also have additional security elements added, including eye recognition software and fingerprint scanning components. Software such as LoJack for Laptops, Laptop Cop, and GadgetTrack have been engineered to help people locate and recover their stolen laptop in the event of theft. Setting one's laptop with a password on its firmware (protection against going to firmware setup or booting), internal HDD/SSD (protection against accessing it and loading an operating system on it afterwards), and every user account of the operating system are additional security measures that a user should do. Fewer than 5% of lost or stolen laptops are recovered by the companies that own them, however, that number may decrease due to a variety of companies and software solutions specializing in laptop recovery. In the 2010s, the common availability of webcams on laptops raised privacy concerns. In Robbins v. Lower Merion School District (Eastern District of Pennsylvania 2010), school-issued laptops loaded with special software enabled staff from two high schools to take secret webcam shots of students at home, via their students' laptops. There are a many laptop brands and manufacturers. Several major brands that offer notebooks in various classes are listed in the box to the right. The major brands usually offer good service and support, including well-executed documentation and driver downloads that remain available for many years after a particular laptop model is no longer produced. Capitalizing on service, support, and brand image, laptops from major brands are more expensive than laptops by smaller brands and ODMs. Some brands are specializing in a particular class of laptops, such as gaming laptops (Alienware), high-performance laptops (HP Envy), netbooks (EeePC) and laptops for children (OLPC). Many brands, including the major ones, do not design and do not manufacture their laptops. Instead, a small number of Original Design Manufacturers (ODMs) design new models of laptops, and the brands choose the models to be included in their lineup. In 2006, 7 major ODMs manufactured 7 of every 10 laptops in the world, with the largest one (Quanta Computer) having 30% of world market share. Therefore, there often are identical models available both from a major label and from a low-profile ODM in-house brand. Battery-powered portable computers had just 2% worldwide market share in 1986. However, laptops have become increasingly popular, both for business and personal use. Around 109 million notebook PCs shipped worldwide in 2007, a growth of 33% compared to 2006. In 2008 it was estimated that 145.9 million notebooks were sold, and that the number would grow in 2009 to 177.7 million. The third quarter of 2008 was the first time when worldwide notebook PC shipments exceeded desktops, with 38.6 million units versus 38.5 million units. May 2005 was the first time notebooks outsold desktops in the US over the course of a full month; at the time notebooks sold for an average of $1,131 while desktops sold for an average of $696. When looking at operating systems, for Microsoft Windows laptops the average selling price (ASP) showed a decline in 2008/2009, possibly due to low-cost netbooks, drawing an average US$689 at U.S. retail stores in August 2008. In 2009, ASP had further fallen to $602 by January and to $560 in February. While Windows machines ASP fell $129 in these seven months, Apple (Mac) OS X laptop ASP declined just $12 from $1,524 to $1,512. The ruggedized Grid Compass computer was used since the early days of the Space Shuttle program. The first commercial laptop used in space was a Macintosh portable in 1991 aboard Space Shuttle mission STS-43. Apple and other laptop computers continue to be flown aboard manned spaceflights, though the only long duration flight certified computer for the International Space Station is the ThinkPad. As of 2011, over 100 ThinkPads were aboard the ISS. Laptops used aboard the International Space Station and other spaceflights are generally the same ones that can be purchased by the general public but needed modifications are made to allow them to be used safely and effectively in a weightless environment such as updating the cooling systems to function without relying on hot air rising and accommodation for the lower cabin air pressure. Laptops operating in harsh usage environments and conditions, such as strong vibrations, extreme temperatures, and wet or dusty conditions differ from those used in space in that they are custom designed for the task and do not use commercial off-the-shelf hardware. A common accessory for laptops is a laptop sleeve, laptop skin, or laptop case, which provides a degree of protection from scratches. Sleeves, which are distinguished by being relatively thin and flexible, are most commonly made of neoprene, with sturdier ones made of low-resilience polyurethane. Some laptop sleeves are wrapped in ballistic nylon to provide some measure of waterproofing. Bulkier and sturdier cases can be made of metal with polyurethane padding inside, and may have locks for added security. 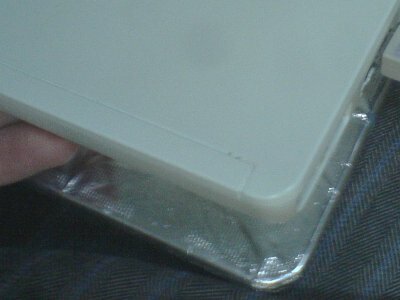 Metal, padded cases also offer protection against impacts and drops. Another common accessory is a laptop cooler, a device which helps lower the internal temperature of the laptop either actively or passively. A common active method involves using electric fans to draw heat away from the laptop, while a passive method might involve propping the laptop up on some type of pad so it can receive more air flow. Some stores sell laptop pads which enable a reclining person on a bed to use a laptop. Last updated on 27 July 2016 at 16:53.